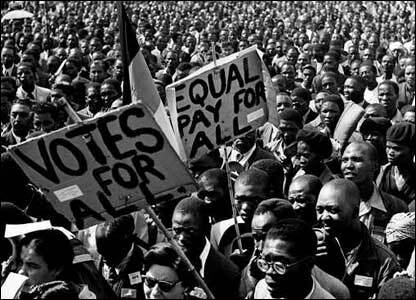 In 1994 South Africa inspired the world as millions of people cued patiently to vote in the country’s first democratic elections. It was the end of apartheid, the forced division of people by the color of their skin. “We the people of South Africa”, said the Freedom Charter of the African National Congress, “declare that our country belongs to everyone. And that all the people shall share in the wealth. The land shall be shared among those who work it. There shall be houses security and the right to work”. … Yes apartheid based on race is outlawed now. But the system always went far deeper than that. The cruelty and injustice were underwritten by an economic apartheid which regarded people as no more than cheap expendable labor. It was backed by great business corporations in South Africa Britain, the rest of Europe and the United States . And it was this apartheid based on money and profit that allowed a small minority to control most of the land, most of the industrial wealth and most of the economic power. Today the same system is called, without a trace of irony the Free Market. This entry was posted in Film and tagged aparthied, Capital, south africa. Bookmark the permalink.